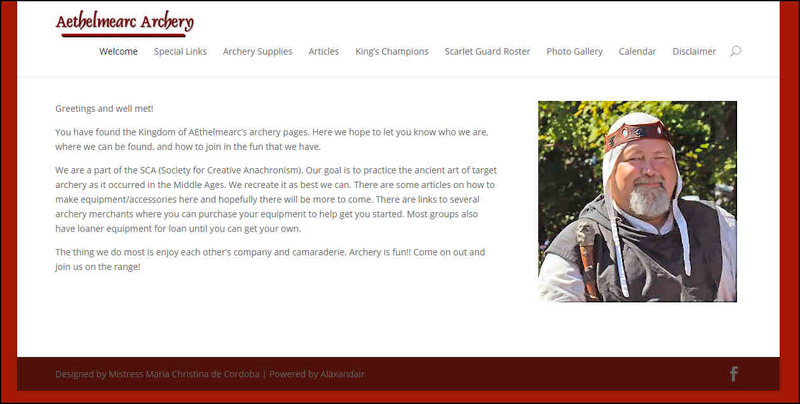 Baron Edward Harbinger, Æthelmearc’s Archer General, recently announced a new website for the Kingdom’s archers. Mistress Arianna of Wynthrope interviewed him about what the new site offers. Q: What prompted you to develop the new archery website? I have felt that the archers of Æthelmearc needed a place to call their own. I remember when THLord Cétach Fitzgibbon had it up and running years ago. It was a good place to go and find information about archery and further your knowledge in general. We haven’t had an archery page in about 7 years, and I feel participation may have gone down for it. Q: What did you feel was missing from existing online archery venues? Other venues weren’t going to help us find out who our more experienced archers are, like the Scarlet Guard. There wasn’t any other listing of who the members are until the new Order of Precedence was created, which wasn’t around when we started creating this page. Q: How do you anticipate it helping the archery community in Æthelmearc? I’m hoping that this page can become a repository of information to help the archery community. We have information on different kinds of shoots and targets. There will be a link to the most current rules once they have been passed. There is a listing of past Kingdom Champions as well as Scarlet Guard members. 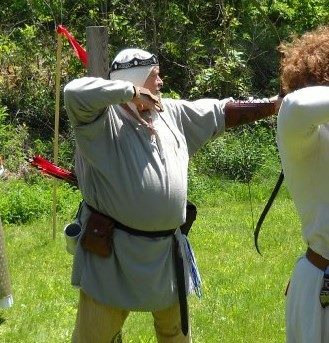 I’m hoping people will want to submit articles on bow and arrow building as well as quiver and arm guard patterns…..anything to help out the less experienced archers. There is also a map with events that have a strong archery influence to help plan out the eventing season. We are hoping to get more submissions of pictures to post. I feel that seeing pictures of people having fun shooting, and letting people know that it is handicap friendly and available to our youth will help stimulate growth in our community. Q: Who else was involved in its development, and will anyone else be helping to maintain it? I have had some help setting up this site from Master Alaxandair Ó Conchobhair and Mistress Maria Cristina de Cordoba. They have been instrumental to this happening and teaching me how to maintain the site. Q: Will it be used to record Royal Rounds eventually, or will that site remain separate? As this is a personal site, the Royal Rounds will remain on the Kingdom Scorekeeper’s site. Baron Edward Harbinger. Photo courtesy of Baron Edward. Q: What else do you plan to include on the site over time? I would like to see all types of leatherwork shown (especially as I am a leatherworker). I would like to get more articles on designing shoots and targets. Photos are always appreciated. I will be writing some articles myself but will gladly take submissions from others. I’m hope that our more experienced archers will join me in helping to spread our knowledge to the populace at large. I want to set up this site for the use of Archer Generals who come after me. I talked about this with the former Archer General [Master Urho Waltterinen] and he had told me to go ahead, but not to expect anyone to take the lead after me. That is why I have made this a personal site. I will maintain it, and will seek to get input from the Archer Generals who come after me, but it is truly for the archers of Æthelmearc; it is their page, a place they can show their pride in their martial art form.